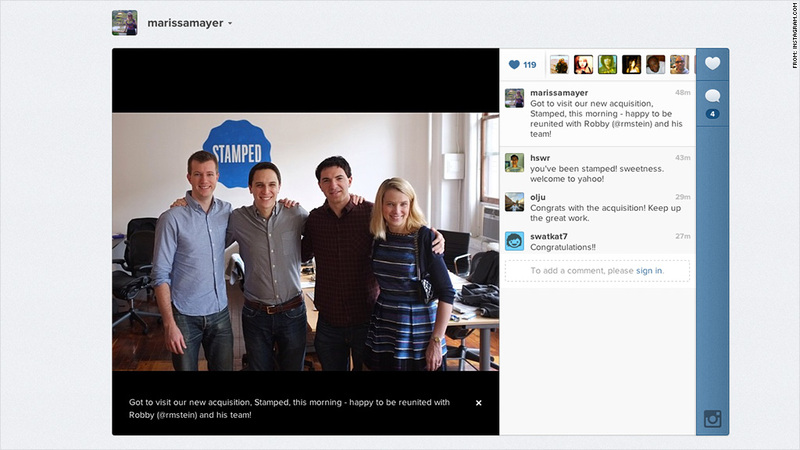 Marissa Mayer touted her newest purchase, Stamped, on her Instagram account. Yahoo has acquired its first company under the leadership of new CEO Marissa Mayer: Stamped, a New York startup backed by a roster of celebrity investors, including Ryan Seacrest and Justin Bieber. Launched just over a year ago, Stamped created a mobile recommendations platform that allowed customers to "stamp" everything from a favorite restaurant to a beloved song. Yahoo (YHOO) isn't keeping the product, though. It will shut down by the end of the deal, Stamped's founders wrote Thursday in a message announcing the deal. The deal was strictly a talent acquisition. Stamped's nine employees all plan to join Yahoo and will head a New York-based engineering and product team. "After everything we learned from building Stamped, we're excited to start work again on something big, mobile, and new," the founders wrote. The deal fits with the mobile-first strategy Mayer laid out earlier this week on Yahoo's quarterly earnings call. Yahoo "hasn't capitalized on the mobile opportunity," she said, calling it Yahoo's new "top priority." The price of the acquisition was not disclosed. A source close to the company says Stamped had more than one offer on the table and chose Yahoo because of the team's past experience with Mayer. "As a team of mostly former Googlers, we've all worked with and are big fans of Marissa," Stamped's founders wrote on their website. "So when an opportunity arose to become a part of the team at Yahoo, we jumped." The crew is already looking to hire additional engineers and designers to expand Yahoo's New York presence.